The first Wildfire All Pottery Showcase was held in 2005 with an opportunity for you to buy directly from some of Central Oregon’s finest potters. Clay Guild of the Cascades sponsors this event to promote our passion for clay and to further clay education in the community. This continues to be the biggest and most exciting ceramic show and sale of the year in Central Oregon! Who is the Clay Guild of the Cascades – Formed in 2004, the Guild members share a passion about pottery and their role in the community. 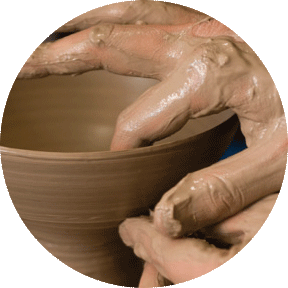 They have an active membership that supports educational workshops, participates in charitable projects in the community – they work to promote the appreciation of handmade pottery and ceramics. Who will be exhibiting – over twenty local and guest potters will display and sell their work from individual booths. A selection of the best pieces, the ‘Best of the Show’ chosen by the artists themselves, will be available for viewing in the gallery in the center of the show. Most pieces in the gallery will be available for sale. What will be happening – Along with pottery for sale by individual artists, we are featuring continuous ceramic demonstrations in the event hall. This year the Guild will sponsor five $25 gift Raffles. Three raffle drawings will be on Saturday and two on Sunday. What can I do – Come along to Highland Magnet School Gymnasium and browse the fine works in the gallery, shop ’til you drop, see the demonstrations, see how you can become more involved by talking with Guild members. Children’s Clay area will be open throughout the event.